Pathways in Crime aims to advance knowledge of the interactions between individual characteristics and social contexts in producing offending behaviour, and to assist in the development of improved public policies reducing criminality and enhancing individuals' life chances. 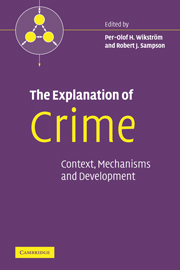 Each book in the series will identify central problems and key issues on a topic by examining pathways in crime in relation to contexts and mechanisms, methods and analytical techniques, innovative research, and policy implications. This series will appeal to students, researchers and scholars of sociology, psychology, criminology, and social and public policy.